Constitutive mRNA expression and secretion of proinflammatory and anti-inflammatory cytokines was comparatively analyzed in rheumatoid arthritis (RA) synovial fibroblasts (SFB), isolated from primary culture or derived by repeated passage; normal-skin fibroblasts were used as controls. First-passage RA-SFB (n = 3) secreted large amounts of IL-6 (15,800 ± 2,110 pg/ml; mean ± SEM), but only limited amounts of tumor necrosis factor (TNF)-α (22.1 ± 1.1 pg/ml) or IL-10 (35.7 ± 34.2 pg/ml; only one of three samples was positive). IL-1β, IL-15, and IL-18 were not detectable at the protein level and showed very low mRNA levels by semiquantitative RT-PCR. In repeated-passage RA-SFB (tenth passage), protein secretion was significantly lower for IL-6 (one-twentieth of the initial level) and TNF-α (two-thirds), and markedly reduced for IL-10 (one-quarter, with only one of three samples positive). While the decrease of IL-10 protein from first to tenth passage was paralleled by a corresponding decrease of mRNA, the relative mRNA levels for IL-6 and TNF-α were actually increased (20-fold and 300-fold, respectively), indicating post-transcriptional and/or post-translational regulation of these cytokines. Due to highly variable levels among individual patients, however, no significant differences were observed for any cytokine mRNA between primary-culture and repeated-passage RA-SFB (ninth passage). Likewise, no significant differences were detectable between RA-SFB and normal-skin fibroblasts (primary-culture and repeated-passage). By producing high amounts of IL-6 and limited amounts of TNF-α, RA-SFB may contribute to the (im)balance of proinflammatory and anti-inflammatory cytokines in the inflamed joint. Activated synovial fibroblasts (SFB) appear to play a major role in the pathogenesis of rheumatoid arthritis (RA) [1,2]. It has been speculated that their ability to induce and perpetuate inflammation, as demonstrated in transfer experiments in mice with SCID (severe combined immunodeficiency) [3,4,5], is associated with the production of proinflammatory cytokines. Exuberant concentrations of various cytokines have been detected within the arthritic joint, such as tumor necrosis factor (TNF)-α ), interleukin (IL)-1β , IL-6 , and IL-8 . Other cytokines have also been detected, including IL-10 , IL-13 , IL-15 , and IL-18 [1,13], although these have appeared to be less prominent. The production of some of those cytokines in RA joints, in particular IL-6 , IL-15 , and IL-18 , has been at least partially attributed to SFB. This cytokine production may drive or control many of the characteristic features of rheumatoid inflammation and may also contribute to the arthritogenic potential of RA-SFB in SCID transfer models [4,5]. However, conflicting data exist about the inherent activation pattern of RA-SFB in culture, which may be in part related to differing isolation methods [16,17,18]. In contrast to conventional procedures (collagenase digest or tissue outgrowth), which require repeated passages in order to isolate sufficient numbers of pure SFB [17,18], we have recently published a protocol for obtaining pure fibroblasts from primary culture using anti-CD14 Dynabeads® to deplete contaminating macrophages . In these studies, primary-culture RA-SFB clearly differed from fourth-passage SFB in phenotypic and functional features, indicating considerable alteration in culture. To investigate whether similar problems apply to their expression of cytokines, this functional feature was comparatively analyzed in RA-SFB isolated by different methods. Normal-skin fibroblasts were used as noninflammatory controls. Synovial tissue was obtained after joint surgery from patients with RA (n = 18) who had given their informed consent. The patients met the American College of Rheumatology 1987 revised criteria for the classification of RA . Foreskin samples were obtained from six healthy individuals. The study was approved by the Institutional Review Board of the University of Leipzig. RA-SFB were isolated either by trypsin/collagenase (Roche, Mannheim, Germany) digestion, short-term in vitro adherence (7 days) to remove nonadherent cells, and negative isolation using magnetobead-coupled anti-CD14 monoclonal antibodies (primary-culture RA-SFB)  or by outgrowth from tissue pieces (repeated-passage RA-SFB; Table 1), a conventional isolation procedure previously used in a number of studies. Skin fibroblasts (FB) were obtained either by Dispase II/collagenase (Roche) digestion of normal skin samples (primary-culture normal-skin FB) or by tissue outgrowth from normal skin (repeated-passage normal-skin FB) (see Table 1). The phenotype and composition of isolated/passaged FB were characterized by flow cytometry in a fluorescence-activated cell sorter (FACS), using saturating amounts of the monoclonal antibodies listed in Table 2 and a FACS Calibur flow cytometer (Becton Dickinson, San Jose, CA) for analysis. Cytokine concentrations in supernatants of primary-culture and repeated-passage RA-SFB (n = 3 each) were assessed using commercial ELISA kits for IL-1β, IL-6, TNF-α (DPC, Bad Nauheim, Germany), IL-10, IL-13, IL-15 (R&D, Wiesbaden, Germany), and IL-18 (Diaclone, Besançon, France), following the manufacturer's protocols. Cytokine mRNA was quantified by isolating the total RNA , converting it to cDNA by standard procedures , and amplifying the DNA by PCR using specific primers for the cytokines TNF-α, IL-1β, IL-6, IL-10, IL-13, IL-15, and IL-18. Quantification of relative units of cDNA was performed using 32P-end-labeled oligonucleotides as probes , normalizing the relative concentrations of cytokine cDNA to those of cyclophilin. Lipopolysaccharide-stimulated peripheral blood mononuclear cells (PBMC) were used as positive controls for cDNA quantification of IL-1β, IL-10, TNF-α, and IL-13; TNF-α- and IL-1β-stimulated primary-culture normal-skin FB were used as controls for IL-6, IL-15, and IL-18. Controls were designed to yield maximum expression of the relevant cytokine mRNA. For statistical analysis, only PCR experiments with a coefficient of determination r2 > 0.9 in linear regression were used. The mRNA levels of different FB were compared using the Kruskal–Wallis test followed by the Mann–Whitney rank sum test. Correlations between clinical parameters of each patient (age, rheumatoid factor, disease duration) and cytokine mRNA levels were calculated using the Spearman rank correlation. In all cases, differences were considered statistically significant at the level P ≤ 0.05. All cell preparations were highly enriched for FB, as determined by positivity for prolyl-4-hydroxylase and for CD90 (mAb [monoclonal antibody] AS02 ; Fig. 1 and Tables 2 and 3). Contamination with CD3+ T cells, CD19+ B cells, CD14+ and/or CD68+ macrophages, and vWF+ and CD31+ endothelial cells was routinely below 2% with the exception of primary-culture normal-skin FB, which contained approximately 6% vWF+ (von Willebrand's factor-positive) and CD31+ cells (see Fig. 1 and Tables 2 and 3). Expression of surface and intracellular molecules in primary-culture or repeated-passage rheumatoid arthritis synovial fibroblasts (RA-SFB) and in primary-culture normal-skin fibroblasts (FB). All preparations were highly enriched for FB, as demonstrated by expression of prolyl-4-hydroxylase and CD90 (Thy-1). Contamination with endothelial cells (indicated by von Willebrand's factor), T cells (indicated by CD3), B cells (indicated by CD19), and macrophages (indicated by CD14) was below 2%, with the exception of contaminating endothelial cells in primary-culture normal-skin FB, which averaged approximately 6% (see Table 3). ? ?, controls; ? ?, cell markers; M1, gate set in order to exclude 99% of the cells stained with the respective isotype control; percentages indicate the percentage of cells positive for each marker, numbers on the x axis indicate fluorescence channels. Values are means ± SD of positive cells. Intracellular, antigens detected following permeabilization of the cells; the remaining antigens were detected by surface staining. FB = fibroblasts. First-passage RA-SFB secreted large amounts of IL-6 but only small amounts of TNF-α or IL-10 (one of three samples positive) (Table 4). 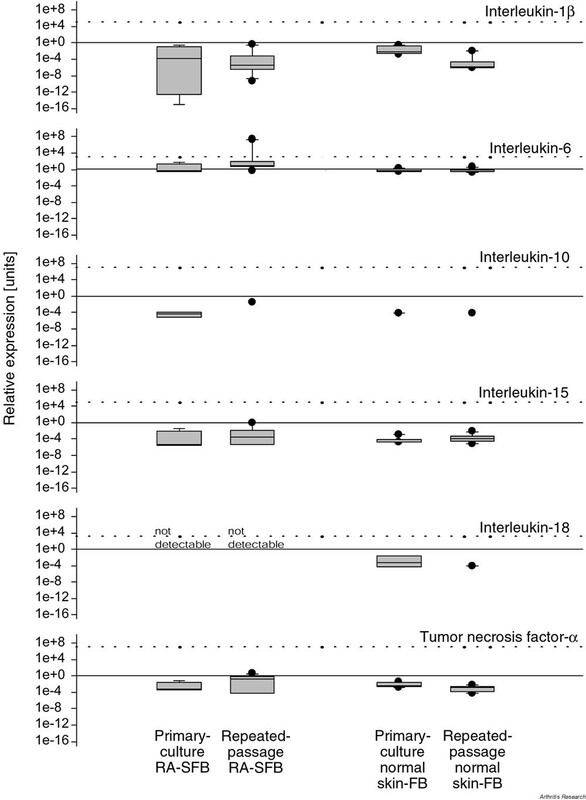 IL-1β, IL-15, and IL-18 protein was not detectable (see Table 4). In repeated-passage RA-SFB (tenth-passage), cytokine secretion was significantly lower for IL-6 and TNF-α and was markedly lower for IL-10 (one of three samples positive) (see Table 4). bCytokine detected in only one of three samples. *P ≤ 0.05 in comparison with first-passage RA-SFB. The lack of IL-1β, IL-15, and IL-18 protein secretion by first-passage RA-SFB was reflected by very low levels of mRNA in primary-culture cells (Fig. 2). Whereas the decrease of IL-10 protein secretion in RA-SFB from the first to the tenth passage was paralleled by a corresponding decrease in mRNA levels (only one positive sample in the ninth passage), the levels of mRNA for IL-6 and TNF-α increased with time (20-fold and 300-fold increase of the median, respectively), suggesting post-transcriptional or post-translational regulation (see Fig. 2). There were large variations of the cytokine mRNA levels between individual patients, conceivably preventing significant differences among groups (see Fig. 2). Quantification of cytokine mRNA in primary-culture (n = 5) or repeated-passage RA-SFB (n = 7) and primary-culture or repeated-passage normal-skin FB (n = 6 each). Levels of mRNA (relative units) for the various cytokines were determined by semiquantitative RT-PCR and normalized to those of the housekeeping gene cyclophilin. Data are expressed as box plots showing the median and percentiles 25 and 75. The dotted line in each graph depicts the cytokine mRNA level in stimulated control cells (i.e. lipopolysaccharide-stimulated peripheral blood mononuclear cells for IL- 1β, IL-10, and TNF-α; and TNF-α and IL-1β-stimulated primary-culture normal-skin FB for IL-6, IL-15, and IL-18). Large, filled dots represent mRNA levels in individual patients outside the 25 th and 75 th percentiles. FB = fibroblasts; RA-SFB = rheumatoid arthritis synovial fibroblasts. Interestingly, mRNA for IL-10 was detected only in three of five primary-culture RA-SFB samples and two of six primary-culture normal-skin FB samples. Limited IL-10 expression would be compatible with a minimal contamination of macrophages (approximately 0.7%) demonstrated by FACS. Passaged SFB or skin FB contained only individual positive samples (see Fig. 2). IL-18 mRNA was present in three of six primary-culture normal-skin FB samples and in two of six repeated-passage normal-skin FB but was not detectable in primary-culture and repeated-passage RA-SFB (see Fig. 2). IL-13 mRNA was not detectable in any of the FB samples; in contrast, IL-13 mRNA was readily detectable in lipopolysaccharide-stimulated PBMC used as positive control (data not shown). No significant correlations (Spearman rank correlation) were observed between the age, rheumatoid factor status, or disease duration of individual RA patients and the cytokine mRNA levels in SFB. The present study demonstrates considerable alterations in the cytokine expression of repeated-passage RA-SFB upon extended in vitro culture, as shown by significantly lower protein concentrations for IL-6 and TNF-α and non-significant changes in the mRNA levels for almost all cytokines. These findings are important because most studies have been performed with fibroblasts at higher passage (3–10), which are prone to similar alteration in vitro. They also point to the suitability/usefulness of isolated early-passage cells for studies on the features/functional characteristics of SFB in RA. A high percentage of RA-SFB positive for FB markers (≥ 97%) and a contamination of <2% leukocytes and endothelial cells indicated a limited contribution of contaminating cells to the cytokine expression. Primary-culture normal-skin FB, however, showed a contamination of approximately 6% endothelial cells, possibly accounting for the detection of IL-18 mRNA. IL-6, a pleiotropic cytokine produced predominantly by synovial macrophages and fibroblasts, plays a major role in cellular activation. The detection of high levels of IL-6 mRNA/protein (see Fig. 2 and Table 4) agrees with previous observations in passaged SFB/synoviocytes [24,25,26,27,28]. In those studies, however, stimulation of cells with IL-1β or TNF-α was necessary to induce the production of 80–90 ng/ml of IL-6 . In the present study, in contrast, first-passage RA-SFB constitutively secreted IL-6. This indicates a high intrinsic activation status of the cells, i.e. retention of in vivo features present before removal from the synovial membrane . A clearly decreased IL-6 production in repeated-passage RA-SFB (see Table 4) may represent culture alterations due to the lack of cytokine stimulation. IL-10 is produced by T cells, B cells, mast cells, and activated monocytes or macrophages. Its primary function appears to limit and terminate inflammatory responses (including those in experimental arthritis). In contrast to recent suggestions , the capability of RA-SFB to produce IL-10 remains uncertain. First, synovial macrophages, rather than SFB, are known to produce considerable amounts of IL-10 [31, reviewed in 32]. Second, the low amounts of IL-10 detected in primary-culture RA-SFB in the present study are probably the product of the few remaining macrophages (see Table 3). This hypothesis is supported by the lack of IL-10 protein/mRNA detected in most repeated-passage RA-SFB (only one positive sample each), which lack contaminating macrophages. Similarly, the proinflammatory cytokine TNF-α is predominantly produced by synovial macrophages [25,33,34], and not by SFB [35,36,37]. In contrast to IL-10, however, TNF-α protein or mRNA were also detected in repeated-passage RA-SFB (lacking contaminating macrophages). TNF-α may therefore be a genuine product of RA-SFB, allowing these cells to contribute to synovial inflammation. Its significantly decreased production in repeated-passage RA-SFB may reflect either loss of macrophages and/or in vitro alterations of SFB due to withdrawal of cytokine stimulation. In this study, no IL-1β protein (and only minimal amounts of IL-1β mRNA) was detected in primary-culture and repeated-passage RA-SFB. This result is in contrast to reports showing IL-1β mRNA or protein in nonstimulated RA-SFB [24,38]; however, it confirms findings that showed expression of IL-1β mRNA but lack of secretion of IL-1β protein by RA-SFB . As for TNF-α, the detection of IL-1β mRNA in repeated-passage RA-SFB suggests some IL-1β transcription. IL-13 is an anti-inflammatory cytokine expressed in a subset of activated T cells. It downregulates macrophage activity and thereby reduces the production of proinflam-matory cytokines. IL-13 mRNA was not detectable in any of the FB preparations assayed, in good agreement with the lack of IL-13 protein production by passaged RA-SFB, whether nonstimulated or after stimulation with IL-1β, TNF-α, or lipopolysaccharide . Therefore, it appears that RA-SFB do not contribute to the local production of this potent anti-inflammatory cytokine [11,40]. IL-15, an IL-2-like cytokine produced by monocytes/ macrophages, dendritic cells, fibroblasts, and bone-marrow stroma cells, activates cell proliferation, cytotoxity, and cytokine production in natural killer cells and is a potent chemoattractant for T cells. Low levels of IL-15 mRNA were detected in all FB preparations; however, IL-15 protein was absent in the supernatants of first-passage or repeated-passage RA-SFB (see Fig. 2, Table 4). This finding is in contrast to reports showing IL-15 mRNA and protein in repeated-passage SFB cell lines (approximately 50 pg/ml; ). However, a lower expression of IL-15 mRNA in SFB cell lines in comparison with freshly isolated synovial tissue cells (containing synovial macrophages, the predominant producers of IL-15 [12,15]) strongly indicates that RA-SFB produce very little, if any, IL-15 . IL-18 is produced by PBMC, dendritic cells, and activated endothelial cells and has pleiotropic effects on T cell functions. The failure to detect IL-18 mRNA or protein in non-stimulated, primary-culture, or repeated-passage RA-SFB confirms previous reports in nonstimulated, passaged RA-SFB lines . The capability of FB to express IL-18 mRNA  was confirmed by its detection in nonstimulated (see Fig. 2) and TNF-α/IL-1β-stimulated primary-culture normal-skin FB (dotted line in Fig. 2). However, we cannot exclude the possibility that contaminating endothe-lial cells were a source of IL-18 mRNA in these cultures . Interestingly, the cytokines IL-1β, IL-6, IL-15, and TNF-α in RA-SFB showed a dissociated pattern of mRNA and protein expression, suggesting post-transcriptional or post-translational regulation. Such regulation (at the level of mRNA stability, translational efficacy, stability of the protein product or other post-translational modifications) has been demonstrated for IL-1β [41,42,43], IL-6 [44,45], IL-15 , and TNF-α . Its importance for RA-SFB functions remains to be analyzed. In contrast to our earlier findings , which confirmed reports on the expression of MHC-II in the RA/OA synovial membrane [48,49,50,51], in the present study only 4% of RA-SFB expressed MHC-II molecules (see Table 3). Possible explanations include differences in isolation procedures, in the patient populations analyzed, and in the epitopes of the MHC molecules recognized by the respective monoclonal antibodies [37,52]. On the basis of the present results, the arthritogenic and tissue-destructive properties of RA-SFB in the inflamed rheumatoid joint may be supported by production of high amounts of IL-6 and limited amounts of TNF-α. Early-passage RA-SFB provide a source of cells with limited alteration from the in vivo phenotype/functional features and allow future studies comparing early- with late-stage RA; RA with normal and inflammatory controls; and in vivo with in vitro cytokine production by RA-SFB. Post-transcriptional and post-translational regulation of cytokine production and large variability among samples must be taken into consideration. Synovial tissue was obtained by joint surgery from patients with RA (n = 18) who met the American College of Rheumatology 1987 revised criteria for the classification of the disease . As controls, FB were isolated from six foreskin samples from healthy individuals. The source and characteristics of the specimens used in the study are shown in Table 1. Written, informed consent was obtained from all patients before specimens were collected. The study was approved by the Institutional Review Board of the University of Leipzig. Tissue samples were placed in cell-culture medium containing DMEM and RPMI 1640 (1:2), 10% FCS, 25 mM HEPES, penicillin (100 U/ml), and streptomycin (100 μg/ml; all Gibco, Eggenstein, Germany; hereafter called culture medium) at ambient temperature and processed within 2 hours. RA synovial membrane specimens were washed in culture medium, fat and fibrous tissue were removed, and the remaining synovial tissue was used for further preparation. Isolation of SFB from the RA synovial membrane and of skin FB was performed by two different protocols. For the preparation of primary-culture RA-SFB, synovectomy samples were minced and digested for 30 min at 37°C in phosphate buffered saline (PBS; Gibco) containing 0.1% trypsin followed by a digestion step with 0.1% collage-nase P (Boehringer Mannheim, Germany) in culture medium at 37°C. To resolve cell aggregates, the suspension was filtered through a sterile sieve (80 mesh, Sigma, Deisenhofen, Germany). The cells were collected by centrifugation after two washing steps with medium and cultured for 7 days in culture medium at 37°C in a humidified atmosphere containing 5% CO2. The nonadherent cells were depleted by medium exchange every 2–3 days. Macrophages were then depleted by incubation with CD14-coated Dynabeads® (Dynal, Oslo, Norway) as follows: Trypsinized and washed synovial cells from primary culture (107/ml) were incubated with 4 × 107/ml Dynabeads® M-450 CD14 (clone RMO52; Dynal) in PBS/2% FCS for 1 hour at 4°C with bidirectional rotation. Nine ml of PBS/2% FCS was added and the conjugated cells were collected by using the Dynal Magnetic Particle Concentrator®. Unconjugated SFB were collected, washed twice in PBS/2 % FCS, and used for mRNA preparation. Primary-culture normal-skin FB were prepared by first incubating skin samples with Dispase II (0.5 U/ml; Boehringer Mannheim) overnight at 4°C, removing the epidermis, and digesting the rest with 0.25% collagenase P (Boehringer Mannheim) in DMEM/1% FCS at 37°C and 5% CO2 for 4 hours. For the preparation of repeated-passage RA-SFB and repeated-passage skin FB, cells were obtained by outgrowth from tissue pieces. Small samples of synovial membrane or skin (in the latter case, after overnight incubation with 0.5 U/ml Dispase II [Boehringer Mannheim] at 4°C and removal of the epidermis) with a volume of approximately 30 mm³ were cultured in triplicate for 1–2 weeks using 75-cm2 culture flasks (Greiner, Solingen, Germany). At confluency, the cells were trypsinized with trypsin-EDTA (0.25% trypsin/0.2% EDTA; Gibco) for 5 min and passaged 1:2 in 150 cm2 culture flasks. SFB were used from passages 5 to 14, and skin FB from passages 5 to 13. Passaged SFB and skin FB were tested every 14 days for contamination with Mycoplasma spp. by ELISA (Boehringer Mannheim). 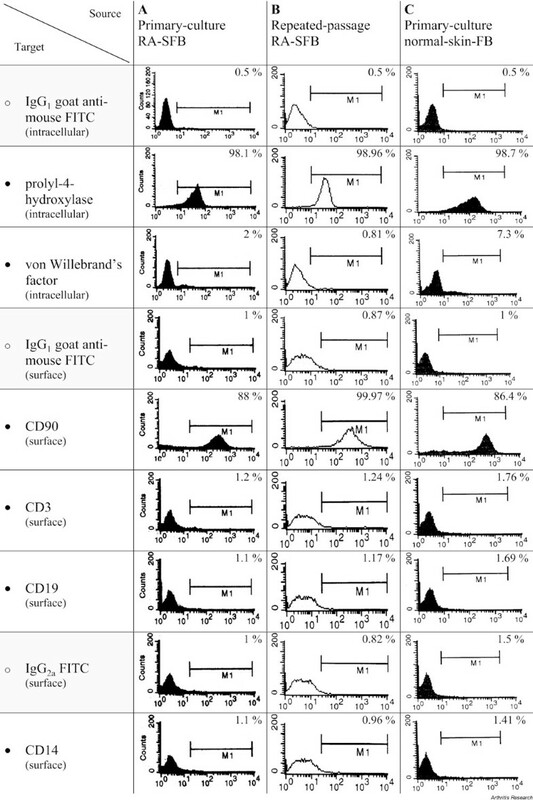 The purity and phenotype of the isolated fibroblasts were characterized by flow cytometry. Cultured cells were harvested with trypsin/EDTA (Gibco) and washed twice in PBS. The cells (2 × 105) were stained with saturating amounts of one of the monoclonal antibodies listed in Table 2 for 30 min at 4°C. In all cases, except for fluores-cein isothiocyanate (FITC)-labeled primary monoclonal antibodies, secondary labeling was performed for 30 min at 4°C with an FITC-labeled goat-anti mouse immuno-globulin (DAKO, Hamburg, Germany). For the detection of intracellular antigens, permeabilzation of the cells was performed using 0.5% saponine as previously described . Cells were analyzed with the FACS Calibur flow cytometer (Becton Dickinson, San Jose, CA). A gate was set to exclude 99% of the cells stained with control immunoglobulin. Total RNA was isolated by a single step guanidinium thio-cyanate-phenol-chloroform method  using Tri-Reagent (Sigma, Deisenhofen, Germany) following the manufac-turer's protocol. The RNA-pellet was dissolved in H2O/0.1% diethyl pyrocarbonate, and the OD260 was determined in a UV spectrophotometer. Ten to sixty micrograms of RNA was obtained per sample. For first-strand DNA synthesis, 2 μg of total RNA was converted to cDNA by incubation with 5 U of avian myeloblastosis virus reverse transcriptase (Promega, Mannheim, Germany), 20 μg/ml oligo(dT) primers (pd(T)12–18; Pharmacia LKB, Uppsala, Sweden) and 1 mM dNTPs for 1 hour at 42°C in a total volume of 20 μl. The cDNA was stored at -20°C until analysis. Before performing semiquantitative PCR experiments, kinetic experiments were carried out to determine the number of amplification cycles for exponential product accumulation. For PCR, 2 μl of the cDNA preparations were incubated with 0.5 U/ml Taq DNA polymerase (Perkin Elmer, Weiterstadt, Germany) in the presence of 1.5 mM mgCl2, 0.4 μM oligonucleotide primers, and 0.2 mM dNTPs (Pharmacia). Amplification was performed with a Gene Amp PCR-System 9700 (Applied Biosystems, Weiterstadt, Germany) using the following conditions: denaturation at 94°C for 5 min, followed by repetitive cycles of denaturation at 94°C (45 s), annealing at 60°C (45 s), and polymerization at 72°C (45 s). The primers and the hybridization probes specific for IL-1β, IL-6, and TNF-α were purchased from Clontech Laboratories (Palo Alto, CA). The primers and the probes specific for IL-13 , IL-10 , IL-15 , IL-18 , and the constitutively expressed cyclophilin mRNA [S1] were deduced from the published sequences and controlled for cross-reactivity by gene-bank search (IL-13: sense 5'-ACA GCT GGC ATG TAC TGT GC-3', antisense 5'-GTT GCC TGT GTG TGA AGT GG-3', hybridization probe 5'-TAG CTT AGA CTT CAG CCT GTG C-3' ; IL-10: sense 5'-ATG CCC CAA GCT GAG AAC CAA GAC CCA-3', anti-sense 5'-TCT CAA GGG GCT GGG TCA GCT ATC CCA-3', hybridization probe 5'-CAT TCT TCA CCT GCT CCA CG-3' ; IL-15: sense 5'-CAG GAC TCG ATG GAG AAT CC-3', antisense 5'-CAT GAA TAC TTG CAT CTC CGG-3', hybridization probe 5'-CCA TCA TGT TCC ATG CTG C-3' ; and IL-18: sense 5'-ACC TCA GAC CTT CCA GAT CG-3', antisense 5'-TCA GGC TGG TCT TGA ACA CC-3', hybridization probe 5'-TTG TCG CAG GAA TAA AGA TGG-3'). Quantification of cDNA was performed using a radioactive protocol that has previously been shown to be highly sensitive and reproducible for similar types of experiments [21,22]. In brief, cDNA containing the gene of interest (positive control) was diluted over a five-log scale and samples of each dilution were simultaneously amplified by PCR. For each cytokine, samples from all fibroblasts were simultaneously amplified in duplicates to minimize inter-assay variations. After the amplification, a sample of each PCR product was transferred onto a nylon membrane (Zeta-Probe Blotting membrane, Bio-Rad Laboratories, Richmond, CA, USA) by alkaline transfer using a slot blot apparatus. Blots were incubated for at least 1 hour at 52.5°C in hybridization fluid containing 6 × sodium chloride, sodium citrate (SSC), 4% Denhardt's solution, 10 mM EDTA, 100 μg/ml denatured, fragmented salmonsperm DNA, and 1% SDS. Amplified target DNA was detected by incubation of the blots in hybridization buffer containing target-DNA-specific γ-32P-labeled probes for at least 8 hours at 52.5°C. Probes were end-labeled with γ-32P using T4 polynucleotide kinase (Promega) as described elsewhere [21,22]. The blots were washed, and hybridized probes were quantified with a radioanalytic imaging system (Bio-Rad). Background counts from areas of the blot containing no amplified sequence (water controls) were subtracted. The amount of hybridized probe was found to be linearly related to the amount of the PCR products in the samples. Using the standard curve obtained by amplification of dilutions of the positive controls (lipopolysaccharide-stimulated PBMC or TNF-α- and IL-1β-stimulated primary-culture normal-skin FB), the relative concentration of initial target DNA in each individual sample could be calculated. The ubiquitously expressed housekeeping gene cyclophilin was used to normalize the amount of cDNA employed in each RT-PCR reaction. The results were expressed as relative units. The sizes of the amplification products were controlled by agarose-gel electrophoresis. To assess the concentration of secreted cytokines, supernatants of primary-culture RA-SFB and repeated-passage RA-SFB were analyzed using commercially available ELISA kits for IL-1β, IL-6, TNF-α (DPC), IL-10, IL-13, IL-15 (R&D), and IL-18 (Diaclone), in accordance with the manufacturers' protocols. The standard curve for each PCR experiment was determined by linear regression analysis. Only experiments with a coefficient of determination r2 > 0.9 were used for this study. Protein/mRNA levels of RA-SFB and of normal-skin FB were compared using the Kruskal–Wallis test followed by the Mann–Whitney rank sum test. Correlations between clinical parameters from each patient (age, rheumatoid factor, disease duration) and cytokine mRNA levels were assessed using the Spearman rank correlation test. In all cases, differences were considered statistically significant if P ≤ 0.05. Supported by grants from the Bundesministerium für Bildung und Forschung (grant 01KS9504A3 to U Sack; Interdisziplinäres Zentrum für Klinische Forschung [IZKF] Leipzig; grant 01ZZ9602 to RW Kinne; IZKF Jena); the Novartis Foundation (to U Sack); and the Deutsche Forschungsgemeinschaft (Sa 606/1–2 and Schu 786/2–1 and 786/2–2 to U Sack and H Schulze-Koops, respectively). We thank Gerald Woitek for providing control tissues; Maria Biskop and Dieter Jungmichel for synovial membrane specimens from patients with RA and skin biopsies; and Ramona Blaschke, Kati Hofmann, and Silke Lehnert for technical assistance. Dr Ernesta Palombo-Kinne is gratefully acknowledged for critical revision of the manuscript.